August 1982, and I'm spending a week on Skye as a prelude to a visit to the Edinburgh Festival. The weather, unsurprisingly, is overcast. 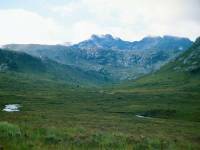 On this day I decided to explore Glen Sligachan, the dramatic and lonely valley that separates the Red Cuillin from the Black Cuillin. 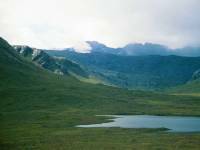 Starting from the Sligachan Hotel north of the Cuillin, Glen Sligachan runs for some 9 km generally southwards towards Loch Coruisk. There is no habitation, there are no trees, just heather moorland, a rough track, and dramatic mountain vistas to either side. I wasn't going to make it all the way to Coruisk and back before the afternoon bus back to Portree, but I determined to get as far as I could. 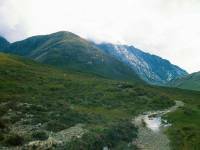 Some seven kilometres, or four miles, down the glen is Harta Corrie (seen here). 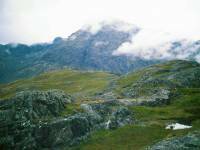 The wild eastern slopes of the northern half of the Black Cuillin ridge drains into this dramatic, empty hollow. From pretty much the same point, we're looking southwards, straight up the glen, with Ruadh Stac and Bla Bheinn to the left. 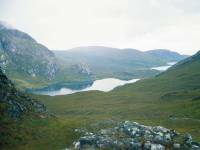 A lonely and remote lochan down near the head of the glen. Bruach na Frithe and Sgurr nan Gillean disappear into the clouds beyond. From the rocky ridge of Druim Hain we're looking east, to the craggy slopes of Bla Bheinn. From the same point, which is as far as I got down the glen before running out of time, we're looking south towards Loch na Creitheach, with part of the bay of Loch Scavaig beyond. Bla Bheinn rises to the far left.